It seems like many of our kitchen appliances, like the slow cooker, collect dust on the counter. 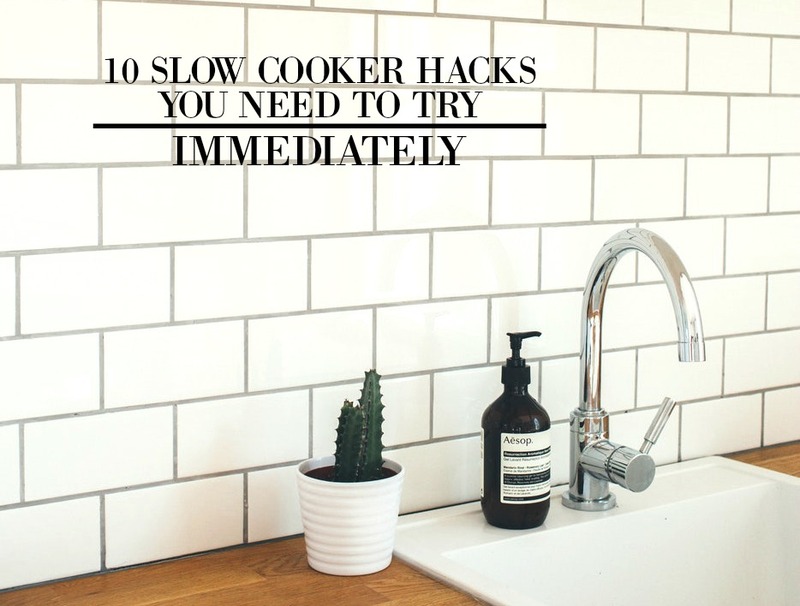 And if you’ve been thinking about minimizing your kitchen, then you might want to check out these ten slow cooker tips before getting rid of it. You’ll be amazed at how your slow cooker has the power to do a lot more than just cook food. Christmas is also at your front door. So expand the versatility of your slow cooker by preparing some fantastic Christmas gifts. These slow cooker hacks will help you out so much more than you think. How to cook two dips at the same time. You can now cook multiple dips at the same time, and guess what? You don’t have to spend extra money on those fancy appliances because your slow cooker can do the job efficiently. You just have to build a middle wall with the help of foil. After cooking, you can clean it up easily. Everyone loves the amazing smell of potpourri. It makes the home smell so inviting. And did you know how effortlessly you can prepare potpourri by mixing all the ingredients into your slow cooker? You just have to wait an hour. Small crockpots are great for making potpourri. You can just turn it off and start it again the next day. This Christmas, if you want to prepare multiple affordable gifts at one time, then you should try this trick. You can make candles from scratch. All you have to do is gather all the ingredients and put them into your slow cooker. It’ll be prepared within hours, and the best thing is you can do it in your house comfortably. How to prepare your breakfast at night. Have you ever thought about preparing your breakfast at night so you don’t have to hurry up in the morning? But how can you do that if you have a slow cooker that is not programmable? All you have to do is purchase a timer, and it’ll make your slow cooker programmable. How to keep your food warm. If you don’t have any idea about when your guests are going to eat, then you just have to follow this super cool trick. Of course, you don’t want to overcook food right? So just turn on the slow cooker and put it on the keep warm setting. Your guests can eat a warm meal no matter what time they eat. This one is amazing. You just have to take mason jars with multiple sundae chocolate toppings. Put them into the slow cooker and allow them to melt. When it’s done, your guests can use them for their desserts. How to prepare home bread. A slow cooker has many different uses and making bread is one of them. First, you need to knead all the ingredients together. Then finish the baking by placing the bread in your slow cooker with wax paper underneath. Your work is done. How to prepare party mix. Who doesn’t like savory and sweet party mix? If you put it on low, it’ll make sure that every bite is crispy and delicious. So now you can welcome your guests with this fun treat. How to use it as dehumidifier. Are you feeling sick? Turn on the slow cooker first, then add water. When the water starts steaming, turn it into a large humidifier. A blend of essential oils or Vicks Vapor Rub will help you get rid of your illness. How to clean your slow cooker. Vinegar and baking soda are the perfect combo for cleaning your slow cooker. Just put the mixture together after turning the slow cooker on low. Let it sit for at least for a couple hours. Then cleaning the crock pot will be so much easier. These slow cooker hacks will save you both time and money. So, instead of letting your crock pot gather dust on the counter top, try out these cool hacks first.